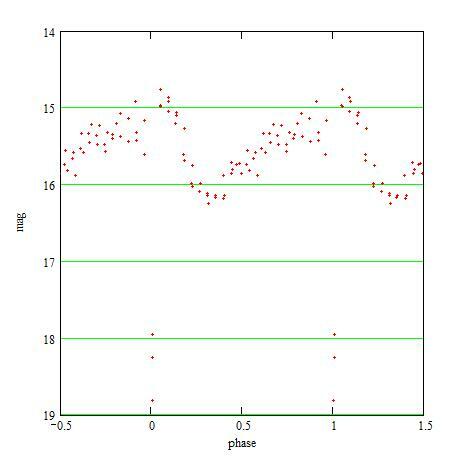 Light curves for this cataclysmic polar with deep, narrow eclipses are presented. The eclipse times are in agreement with the 2006 ephemeris. SDSS J015543.40+002807.2 (or FL Cet or Cet in the Downes catalog of cataclysmics) is a cataclysmic system, that is a binary with an accreting white dwarf. The white dwarf is strongly magnetized, its spin is synchronized with the orbital motion, and the accretion is funneled by the magnetic field (no accretion disk). This type of cataclysmic is a polar or an AM Her type system. The orbital/spin period of SDSSJ0155 is 87.144 mn. The observations were carried out with a 203mm f/6.3 SC telescope, a Clear filter and a SBIG ST7E camera (KAF401E CCD). 66 usable images were obtained, each with a 200s exposure duration. 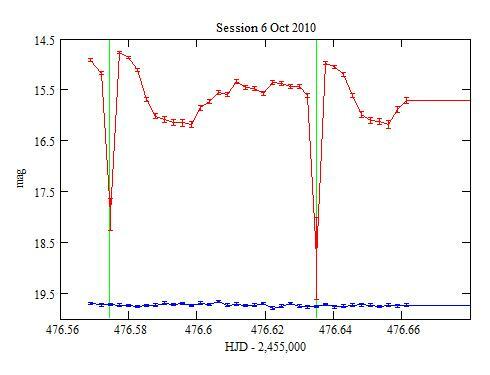 For the differential photometry, GSC 30-1268 was used as the comparison star with an Rc magnitude of 13.927 (computed from the r' magnitude of the CMC14, the 2MASS magnitudes, and the transformations formulae of Bilir et al (2007) and of Smith et al (2002)). The C magnitudes of SDSSJ0155 are measured against this Rc magnitude as the camera is mostly sensitive in the red. 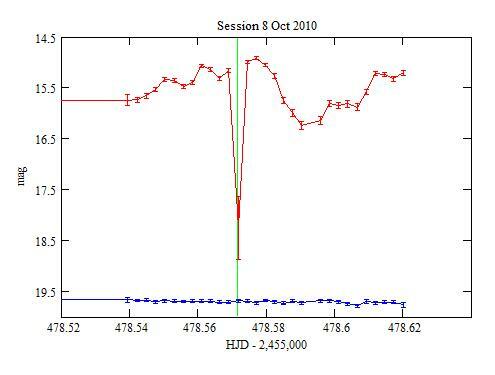 The check star is GSC 30-207 and is measured with the magnitude CR=14.715+/-0.027+/-0.028 where the first +/- is the average 1-sigma statistical uncertainty and the second one is the standard deviation. Bilir S., Ak S., Karaali S., Cabrera-Lavers A., Chonis T.S., Gaskell C.M. (2007) MNRAS arXiv/astro-ph:0711.4356v1. O'Donoghue D., Buckley D.H.A., Balona L.A. et al (2006) MNRAS 372 151. Smith J.A., Tucker D.L., Kent S. et al (2002) AJ 123 2121.